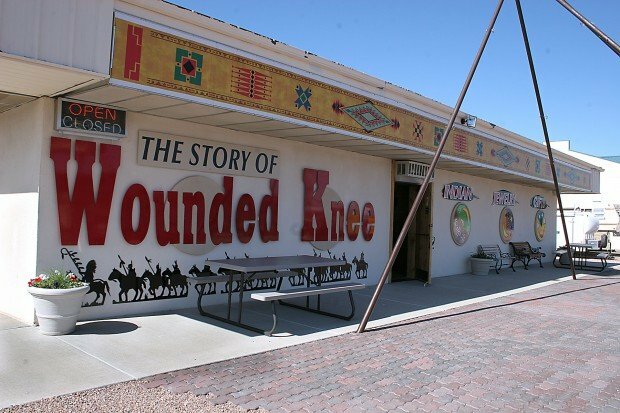 By Ryan LengerichAn electrical fire has destroyed the 10-year-old Wounded Knee Museum in Wall, dedicated to the 1890 massacre on the Pine Ridge Indian Reservation. The building is 80 percent wiped out, and the 30 exhibits inside the 2,600-square-foot structure are a total loss after the fire Sunday night. "It's like a parent losing a child, that is how we are feeling right now," Steve Wyant, the museum co-founder, said Thursday. Wyant couldn't put an estimate on the building and museum's cost. He expects a full report from fire officials to detail the cause more specifically.Comment: This would be a great opportunity to rebuild the museum on or near the Pine Ridge Reservation. You know, not too far from Wounded Knee itself? It kind of belongs there, and it would draw tourists to Pine Ridge. If the owner cares about the Lakota, he should promote them, not their ancestors. For more on the subject, see Pine Ridge Needs Tourism and The Wounded Knee Museum.